Bridebook is a two-sided marketplace with wedding couples as the consumers and wedding services as the suppliers. Bridebook’s approach to their marketplace is to help the engaged couples to manage their wedding from ‘Yes to I do’ starting with the big ticket item of location/venue for the wedding. They have great tools for the couples to entice them to the site and expose to them the powerful wedding supplier search. 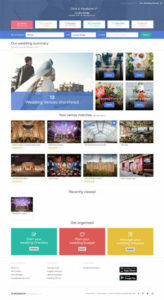 They also have business.bridebook.co.uk which has another great set of tools to help wedding service providers to advertise on bridebook and manage their wedding business.